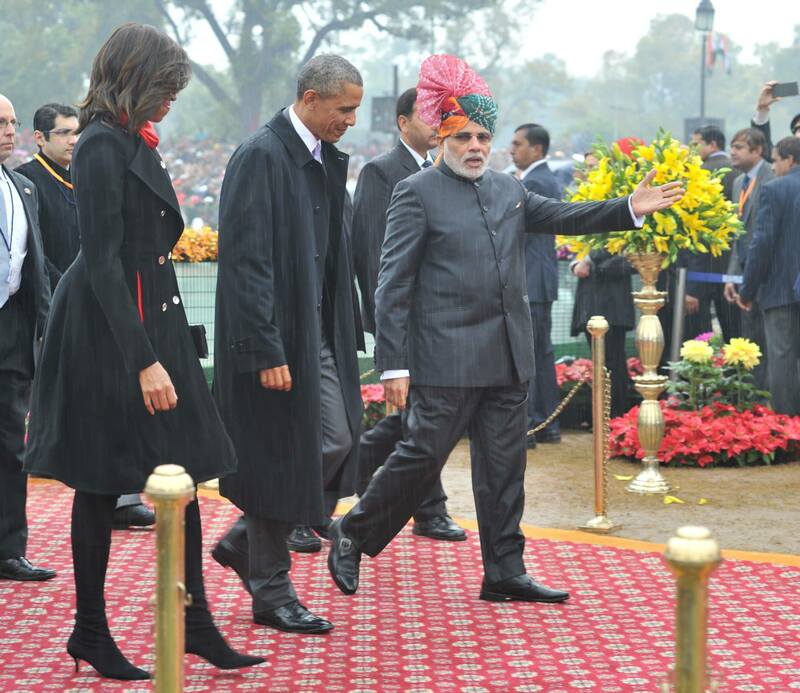 New Delhi, Jan 26 (IANS) If the annual Republic Day parade is known for its pomp and splendour, the 66th edition will remain etched in the memory for two other factors – the women’s power showcased during the two-hour event and the presence of US President Barack Obama as the chief guest on the occasion. Quite appropriately, the honour of leading the marching contingents was given to the one drawn from the three services, while the Indian Army, the Indian Navy and the Indian Air Force also fielded all-women’s contingents. A woman led the Indian Navy contingent while a tableau depicted the success achieved by an all-women’s team in scaling the world’s highest mountain, Mount Everest. All this, coupled with a woman leading the contingent that presented a guard of honor to US President Barack Obama Sunday is reportedly Modi’s way of showcasing women’s power in India – despite the many stories of atrocities on women and the odds stacked against them socially. The day began cloudy and rainy and there were apprehensions that the flypast, one of the most-eagerly awaited events at the parade, would be curtailed but, in the end, the weather cleared sufficiently for this to take place though the sky remained overcast. Before the proceedings began, Prime Minister Narendra Modi, resplendent in a tricolour turban and for whom it was his first Republic Day parade, drove to India Gate to lay a wreath at the Amar Jawan Jyoti memorial to the unknown soldier. Before it commenced, Mukherjee handed over posthumous Ashok Chakras – the nation’s highest military award in peacetime – to the widows of Major Mukund Vardarajan and Naik Neeraj Kumar Singh, who were killed in counter-insurgency operations in Jammu and Kashmir. As in the past, the marching contingents stole the show with their dazzling array of ceremonial uniforms, leaving the audience in the jam-packed stands – despite the cold – spoilt for choice: the blue and gold trimmed tunics of the 61 Cavalry contrasting with the vivid red turbans of the Brigade of the Guards, the red-gold turbans of the Jammu and Kashmir Light Infantry and the green-blue turbans of a Territorial army unit attached to the Punjab Regiment. Most of the paramilitary and police contingents were in regulation khaki but they too got a look-in, thanks to their ceremonial cummerbunds, sashes and turbans. Notably, the mechanised columns were down to a minimum this time around – perhaps to paper over the fact that 70 percent of the hardware with the armed forces is imported, a situation that Modi’s ‘Make in India’ initiative hopes to reverse. The music, as usual, made for considerable patriotic fervour, what with rousing tunes like Sare Jahan Se Aacha, Hanste Lushai, Kadam Kadam Badahe Ja and Sound Barrier, many of which had Obama keeping time – which he also did when the tableaux came on with their wealth of folk music. This also made for a seamless blend of military might and heritage as 25 tableaux – 16 from the states and nine from various ministries – graphically displayed India’s rich cultural diversity. Andhra Pradesh chose to do this through a harvest festival; Madhya Pradesh highlighted the Bhagoria festival of love and matchmaking; Uttarakhand through the pilgrimage to Kedarnath; Sikkim through cardamom farming, Assam by re-creating Majuli, the world’s largest river island; Telangana by re-creating the Golconda fort and Haryana with likeness of the Sultanpur Bird Sanctuary – quite naturally, with twittering birds. The ‘Make in India’ tableau by the department of industrial policy and promotion depicted a mechanised lion against the backdrop of a smart city. The campaign aims to promote manufacturing in India. Another pet project of the prime minister, the ‘Beti Bachao Beti Padhao’ programme, a campaign against female foeticide which he launched from Panipat in Haryana Jan 22, was also featured in a tableau. And, as usual, the flower-bedecked tableau of the Central Public Works Department drew loud applause. It featured the source of the Ganga river high up in the Himalayas. The weather began to lift as the tableaux were rolling down Rajpath and just as the schoolchildren had finished their routines, three Mi-35 attack helicopters of the IAF streamed in through the somewhat cloudy sky. Then, in quick succession came the newly acquired C-130J Super Hercules medium-lift transport, the P8I maritime reconnaissance aircraft escorted by MiG-29 combat jets (both of the Indian Navy), the C-17 heavy-lift transport escorted by Sukhoi Su-30 MKI combat jets and the Jaguars. All this left most spectators with a feeling of “Yeh dil maange more”, but for that they’d have to wait a full year. It would be a wait well worth it.